I am having so much fun as the new host of The Scoop linky party! It gives me a chance to see what all of you wonderfully creative people are up to this summer! I will be featuring some of your creations here on my blog, as well as sharing them on Facebook here and on Pinterest here…so be on the lookout! This week at The Scoop #73, I was inspired by your recipes using fresh summer-time fruits and veggies! Aren’t these veggies beautiful? Fairhope Supply Co. reminded us of the bounty of freshness that is available at our local farmer’s market! Barb at The Everyday Home has my mouth watering with her homemade creamed corn! She adds a secret ingredient that you will want to try! And head over to Happier Than a Pig in Mud for some fun ideas for kicking up your corn on the cob! I love egg salad and I love avocados so I am trying this recipe from Posed Perfection…sounds yummy! And my heart skipped a beat when I saw this one from Rustique Restoration! I think they serve guacamole in heaven! I loved this one from Make Mine Lemon…pineapple buttermilk sherbet! My dad was a big fan of pineapple sherbet…and of buttermilk…so this one has me feeling very nostalgic. I am a huge fan of blueberries. To me they are summer all rolled into one little berry! So you know I loved this recipe for cheesecake with homemade blueberry sauce from Creative Ideas who reminds us that July is National Blueberry Month! Fresh strawberries are another summer favorite of mine! The Kitchen Is My Playground gives us a trio of dips to go along with them! And if you put strawberries and blueberries together, I’ll be the first one in line! Just look at this beautiful blueberry strawberry Charlotte cake created by Twigg Studios! And here they are together again in this berry Caprese bruschetta from Home is Where the Boat Is…so pretty! And finally, I am sneaking in my own recipe here…my no-bake strawberry tunnel cake all decorated for the 4th…but really good all summer long! And now...I am looking forward to seeing what you've created at The Scoop next week! Please join us every Monday night at 6:00 pm Eastern Daylight time to share all of your wonderful creations and ideas! I can't wait to see what you've got! And…mark your calendars! 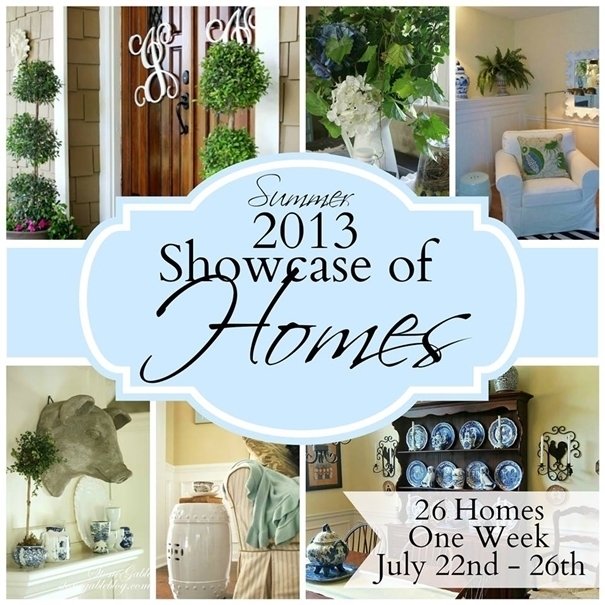 A fun event is coming this summer with 26 bloggers opening up their homes and inviting you inside! I’ll be one of them and I am going to show you a few parts of my house that you have never seen before! Among the bloggers on the tour will be French Country Cottage, Stone Gable, Back Porch Musings, The Everyday Home, Town and Country Living, Cedar Hill Ranch, A Stroll thru Life, Good Life of Design, Adventures in Decorating, Vignette Design and many more of your favorites! Be sure to check back here for more details! Thanks for stopping by! I hope you enjoyed having a little peek at these wonderful fresh summer recipes! Please visit these wonderful bloggers and their beautiful blogs to see what they are up to and to find a list of this week’s participants! Thank you Debbie for the feature :) made my weekend! I'm sorry I missed your debut ...when is the NEXT Scoop??? Oh wow!!! Thank you so much for the feature Debbie! You'll have to let me know what you think when you try the Guacamole! :-D All these other recipes look so amazing too! Can't wait to try them out! Thanks again! Debbie I am just giddy. I am so glad you like my sherbet. Thank you again for letting me join in on the fun. Great recipe ideas to help beat the Summer heat, dear friend!!! I'm thrilled that you are now part of The Scoop!!! Congratulations!!! Thank you for the invitation to the Open House!!! I love seeing your beautiful home!. . .and The Staff!!! These all are fresh and wonderful! Love anything with chocolate or fresh fruit!